My daughter loves Dogs. So when I found a dog Calendar on clearance at Michaels for 10 cents last year I of course had to buy it. I hung the calender up in the play room and each month we change the picture to a different dog. 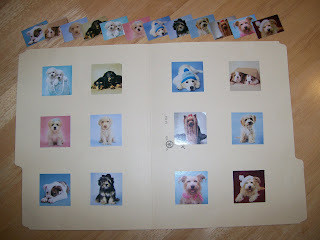 I cut out the little dog pictures on the back of the calendar and made this matching game. We definitely got our moneys worth our of this one. 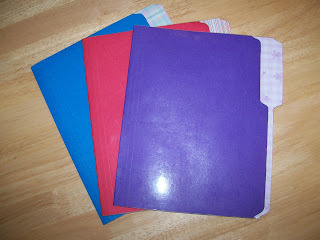 I cut the folders to a smaller size so they would more easily fit in the diaper bag. 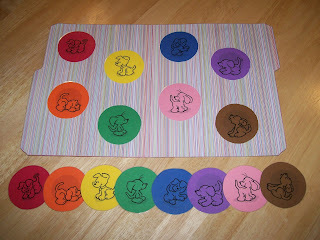 I then lined the inside with scrapbook paper before adding the games. 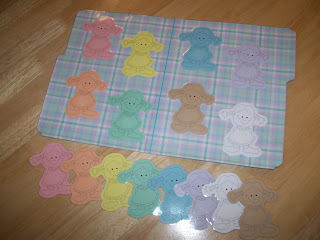 For this and the next one I used clear velcro dots so the matches stick together. This one is a favorite for church. It's a great one to pull out during the sacrament as a reminder of how to behave. Amy, I love this idea... I want to use this for church! Love your site, by the way! Hi, I just stumbled upon your blog and love your cute ideas. I'm wondering where you got those cut outs for how to behave during the Sacrament? 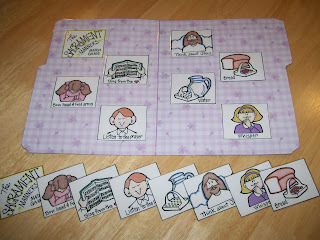 I came over from Sugardoodle love the sacrament one, where did you find the pictures? I LOVE this idea! Can you share where you got the pictures for the sacrament one?